invention | I'm not stalking you. I had a dream. A dream to take the cooking time out of bacon preparation. A dream to eliminate the walk to the back of the store for pre-cooked bacon in a box. 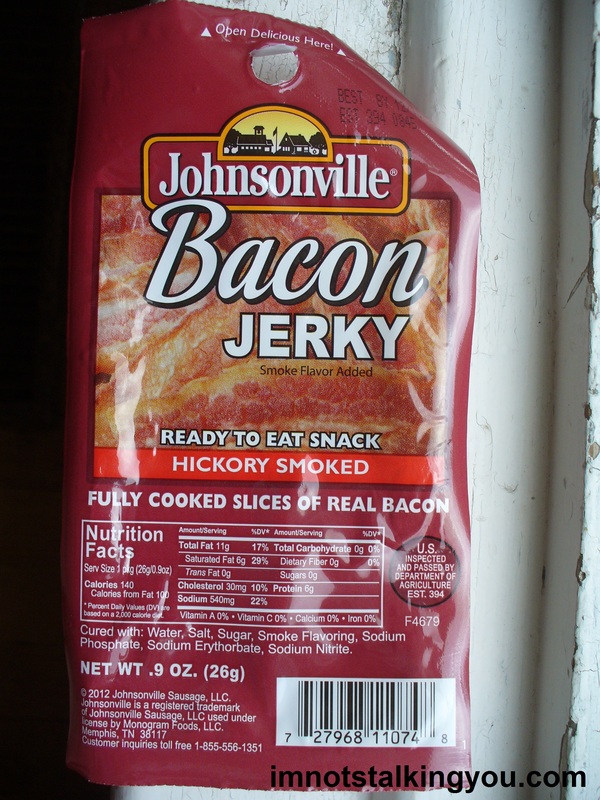 My dream was to hang bacon right next to the beef jerky in a convenience store near you for easy, on-the-go snacking. I was mentally preparing myself to build this empire. …Then I saw that Johnsonville had beaten me to it. Beaten me to my convenience junk food dream. And I found this out at the dollar store, no less! What a sense of disappointment, jealousy, and failure I now feel. Damn you Johnsonville, for thinking of my idea before I did! What I learned this week is that I am always a day late and a dollar short. I’ve also learned that watching TV shows with the closed captioning turned on while on the TV Guide Channel can cause motion sickness. I like to watch Ugly Betty on the TV Guide Channel while my baby naps. But then the TV listings scroll vertically while the closed captioning scrolls horizontally. It makes me sort of seasick. Posted in Entertainment Worship & Review, What I Learned This Week and tagged bacon, beef, closed captioning, convenience, dollar, Dollar Tree, food, humor, invention, jerky, Johnsonville, junk, store, TV, TV Guide, Ugly Betty. Bookmark the permalink.